Congrats to the Kawhi Leornard a.k.a. "The Kawhiet Storm" (stolen from Jalen Rose) on becoming one of the youngest players to win the NBA Finals MVP. Kawhi played his heart out during the entire playoffs and having to defend LeBron James in the Finals is probably the hardest task any coach could ask from a young player. But he did it Kawhietly. There was no pounding on his chest after he dunked over Oklahoma's big 3 in the Western Conference Finals and there was no trash talk when he played locked down defense on the Miami Heat. He just put his head down and went to work. My favorite moment was in Game 5 when he got a defensive rebound, ran down to the other end of the floor and pulled up for a 3 at the top of the key. It was a huge moment because it showed that he had full confidence in himself. It made me want to buy his jersey. I love this illustration of Kawhi by Tim McAuliffe of him because it shows his exaggerated features. He stands 6'7" but has a 7'3" wingspan and his hands measure 11.25" wide. That's insane. The Finals were lopsided and didn't really live up to the hype after last year's Finals. However, the Spurs played some of the best team basketball I've ever seen and anyone who says they're boring to watch doesn't know anything about basketball. It was incredible to see the team bounce back after such a crushing loss last year and dethrone the champs. They truly deserved every bit of this championship. 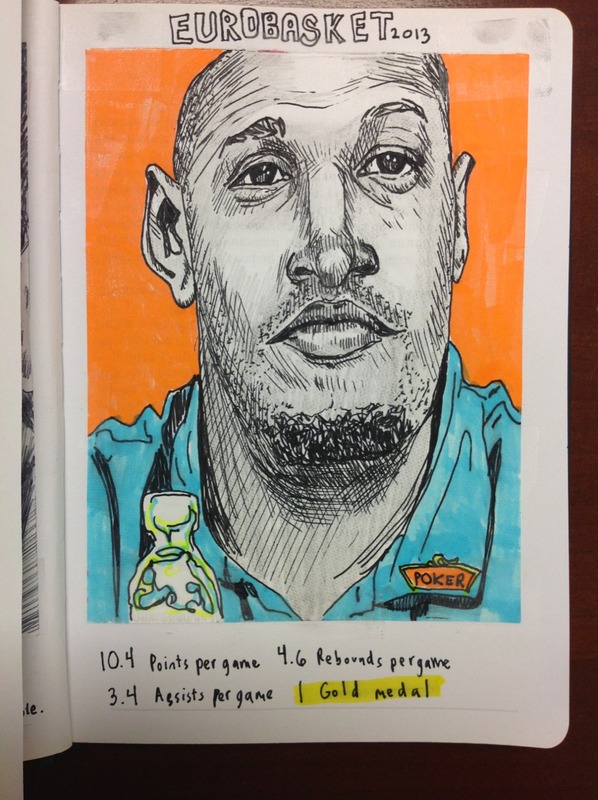 Here's some other illustrations of the Spurs by 15 Minute Sketches, Chris Hsu and Nicholas Kastner.